Hey, here is a simple question. Do you have a quick reference guide for your effect? Right now I am using the blood effects and I have to extract them and then view each one individually to see what it looks like. It takes forever to do this. Do you have pictures snapshots were I can get the basic gist of what the effect looks like so I can quickly find the one that will work for me in this project? Like a video contact sheet? Karen Lay Hi there, the quickest and easiest way to preview all of our effects is with the Rampant Previewer app. The app is for any iOS device. Head over to rampantpreviewer.com or search for Rampant Previewer in the app store. You will find the blood volume under Visual Effects. 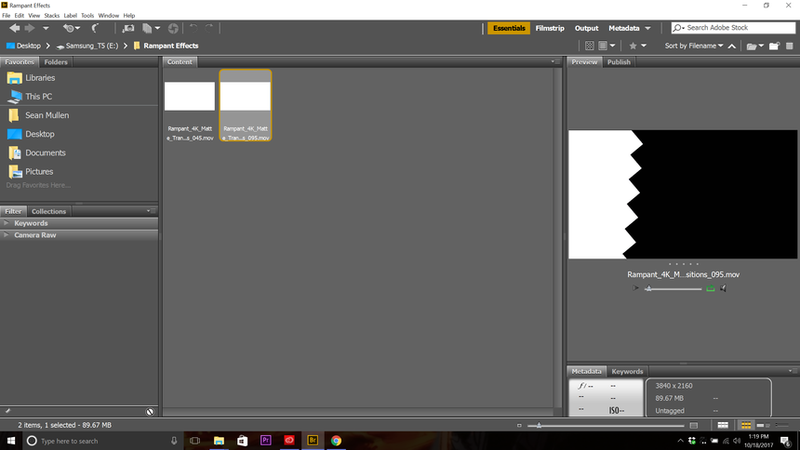 The other solution for previewing the effects fast is to use Adobe Bridge. 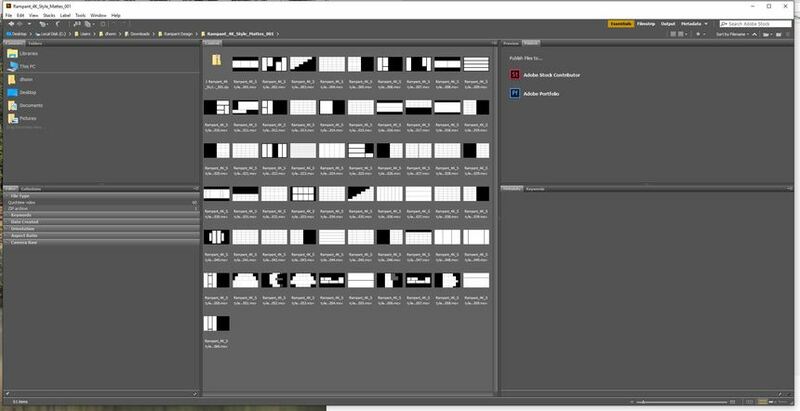 Stefanie Mullen On a Windows PC using Adobe CC, how do you preview the files in Bridge? In Bridge, when I click on the icon to "Preview" the file in the Preview window, I only get the file icon. Of course I can double click the file and it opens the file and I can view it there but that method is WAY too cumbersome for previewing the files. Thanks for the help. This is the easiest way to preview the files on both PC & MAC. Hope this helps. 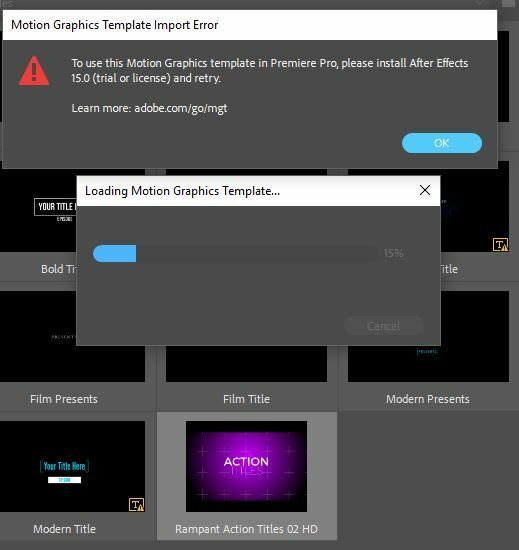 Can't install the action titles 02 mogrt, - get error "to use this motion graphics template in premiere pro, please install AE 15, (trial or lic) and retry. Dan McCormack Hi There. I had this same error when I updated to the latest version of Premiere. I had to update After Effects as well. I simply updated AE, keeping my old AE versions, and I restarted Premiere. 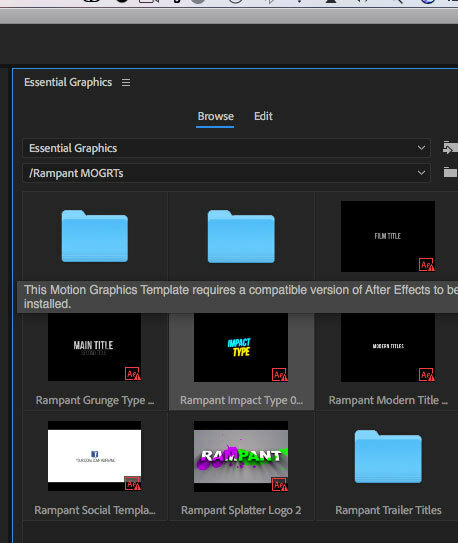 I was able to import the .mogrt files without any errors after opening Premiere the second time. I m updated AE to 2018 - and I did keep the previous installed. Dan McCormack Hi Dan! I'm unable to recreate this on Windows or Mac. I had a convo with Adobe, this is a known bug. They claim that a working solution is to make sure your 2017 versions of AE & Premiere are up to date AND the same with 2018. Also a hard reboot may work. They are still working out the bugs in their templating system. Dan McCormack You may need to contact Adobe about this. I attached a pic of what Premiere was showing when I updated to the latest version of Premiere (before I updated AE). After I updated AE and restarted Premiere, that message was no longer showing. Dan McCormack That is so odd. Have you contacted Adobe yet? I would ask them why your Essential Graphics panel is not communicating with your AE installation. I contacted Adobe about this issue. The problem is with Adobe and not our products. 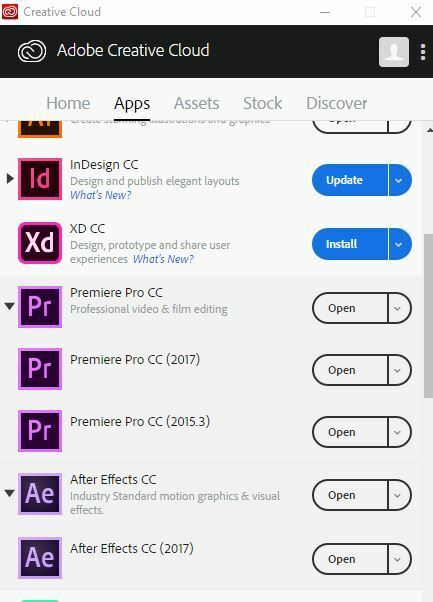 Adobe suggests uninstalling both Premiere Pro and After Effects through the Creative Cloud application. Once uninstalled, reinstall both apps and the error should be resolved. Hopefully this helps but if not, I would definitely suggest for you to contact Adobe and have them screen share on your computer so they can see the error first hand. Stefanie Mullen will try to store up some patience for an adobe help call... - the uninstall and reinstall didn't fix. I updated all of my Adobe CC apps to 2018. That solved the issue in Bridge. Having a preview makes it soooo much easier. Thanks to everyone. especially Adobe & Rampant who both make awesome products! Dale Honning thanks for your kind words Dale! I'm glad this is resolved!